Cankarjev dom – Cultural and Congress Centre Ljubljana has on the centennial of Ivan Cankar's death, together with Elementum ltd. issued a commemorative coin. This year, Cankarjev dom – Cultural and Congress Centre Ljubljana has been running special all-year-round programmes to acknowledge the centenary of the death of the greatest Slovenian writer Ivan Cankar, whose name the biggest Slovenian congress centre is wearing with pride. 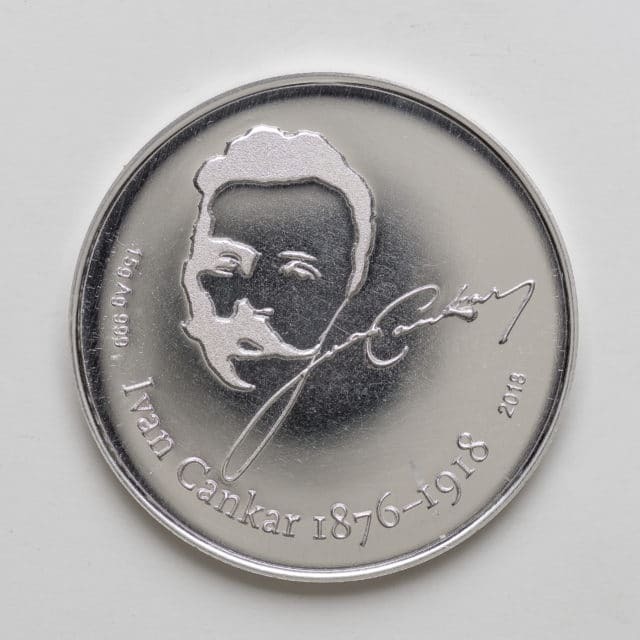 One of this year’s projects dedicated to Ivan Cankar has been a collaboration between Cankarjev dom and Elementum ltd. in issuing a commemorative coin. The silver coin has on one side an effigy of Ivan Cankar and his signature, while on the other side it has a map of Slovenia and the year marking Slovenia’s independence. The coin was designed by Cankarjev dom’s creative director Maja Gspan. As Ivan Cankar was instrumental in raising the Slovenian literature to the global level, Slovenia’s largest cultural and congress centre proudly wears his name and recognises Ivan Cankar’s enduring cultural legacy and pursues the mission of presenting it also to future generations. Cankarjev Dom, thus, as already mentioned, this year acknowledges the centenary of his passing in many forms: with the beautiful silver coin which is an example of a perfect gift to get when attending a congress in Cankarjev dom; a special all-year-round programme under the name of Festival Cankar on Cankar; a two-venue exhibition at Cankarjev dom and the City Museum; the Cankar on Cankar Festival also includes a small-scale exhibition, I Am Ivan Cankar – And That Says It All!, theatre performance Bailiff Jernej and an international symposium on Ivan Cankar.